Perform your selection (with or without accompaniment) for music faculty members after school on Tuesday, May 07, 2019. This is a solo recital, not a talent show. As such, selections must be appropriate to the event. Therefore, the directors will exercise the right to refuse a student performance that is either inappropriate or under-rehearsed. Anyone with basic bookkeeping skills would be suited to this role, and our outgoing Treasurer will provide training on processes and procedures. Outgoing Chair has prepared the Membership Process document and materials for incoming Chair and will assist with the transition. Desired skill set: (a) ability to write convincing letters and (b) be organized with documenting, logging gifts received, and following up. Also, we will need new Concert Co-Chairs. If you are interested in any of these positions, please email President, Susan Sather at slsather@gmail.com for more information about the roles. Start fundraising with Scrip for Next Year’s Trip! We will place orders for physical cards on the following dates: 4/19, 5/3, 5/17 and 5/31. The NextDirection choral leadership conference is an opportunity for choral students to explore what it means to be a choral conductor and a music educator. 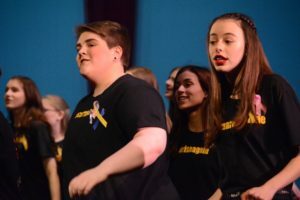 Built on a program developed by the Wisconsin Choral Directors Association, American Choral Directors Association (ACDA) opened up the experience for the first time to students across the country. more students will be able to participate. The headline conductors are Dr. Rhonda Fuelberth (University of Nebraska – Lincoln) and Dr. Jo-Michael Scheibe (University of Southern California,) while artistic and programmatic leadership comes from Wisconsin Choral Directors Association. Click here to learn more. Registration deadline has been extended to April 15, 2019. Register by May 1, 2019. Click here to learn more.